When exposed to oxygen, silver tarnishes. This chemical reaction is worse in areas with a lot of pollution or humidity, according to GoMetalDetecting.com. However, the more silver is used, washed and stored properly, the less it needs to be cleaned with a polish or tarnish remover. Traditional chemicals found in stores to clean silver may be toxic or can harm sensitive skin. There are non-toxic silver cleaners available, but you can make your own with ingredients found in your pantry at home for under $1. Line the inside of a large pot with aluminum foil. Fill the pot with water until it is 75 percent full. Let the water come to a boil. Remove the pot from heat. Pour ½ cup of baking soda and ½ cup of salt into the hot water. The ingredients will fizz in the water. Carefully drop the silver items that need cleaning into the foil-lined pot of water. These items need to touch the foil, so do not pile all the silver pieces in the pot at once. Use tongs to remove the silver items from the hot water after you can see the tarnish is gone. Rinse the silver item well with cold water. Use a soft towel or a microfiber cloth to dry the silver. The electrochemical reaction of the ingredients and the foil is what will cause the tarnish to disappear. 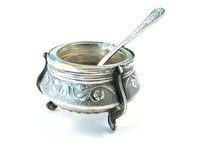 Leave the silver items in the pot of water, baking soda and salt for a couple of minutes. Items that are heavily tarnished may need to soak for up to 5 minutes. Store silver items in a cloth that prevents tarnish build-up. Look in a jewelry store or in the china and flatware section of department store for the cloth, which stores may sell as a pouch. To minimize oxidation to silver platters, plates and flatware, reduce their exposure to foods that have sulfur in them (like onions, mayonnaise, mustard and eggs). For example, line a platter with a doily or use silver plates as chargers for other plates during a meal. Polishing silver-plated items too many times will cause the silver to wear off. Over-cleaning will do more harm than good. Before cleaning antique silver items on your own, take the piece to a jeweler to see if the professional thinks the baking soda and salt solution would harm the piece or wear the metal off.